Bible verses—an enduring source of guidance, peace, and rejuvenation—are here given a very special treatment in colorful letterpress illustrations that bring each phrase to life in a fresh and meaningful way. The verses are drawn from seven translations (including the New International Version, The New Revised Standard Version, and The King James Bible) and arranged in order, beginning with Genesis 1:1. These selections include 100 of the most distinctly meaningful passages of the Old and New Testament, made even more powerful through the transformative lens of art. 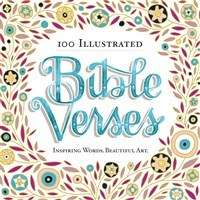 Like a contemporary update on medieval illuminated manuscripts, the book combines the timeless words of the Bible with timely artwork—in this case, hand-lettering and illustration in a variety of beautiful styles and remarkable aesthetics from 25 contemporary artists. It’s a new and vibrant way to experience the living word.